We flew in to Orlando fairly late in the evening on New Year’s Eve and had dinner at my parents’ house that night. Our first full day in the Orlando area was New Year’s Day and we opted to stay near my parent’s place in Clermont, heading over to Disney World on the second day. During those first two nights, we stayed at the Fairfield Inn & Suites in Clermont, which includes a complimentary breakfast with the room. The breakfast was served buffet-style in a lounge area next to the hotel’s lobby. It was ok, but nothing particularly fancy. It mainly included a selection of pastries, hot and cold cereal, bread for toast, a few kinds of fruit, and other typical continental breakfast choices. They did have some microwavable, pre-wrapped breakfast sandwiches as well, but I didn’t try them. I didn’t think the quality was up to what you find at a Holiday Inn Express, which typically have the best breakfasts of this kind, but it was certainly adequate. Lunch was at my parents’ house, but we decided to go out to a Steak ‘n Shake restaurant for dinner. This is a great chain of diner-style burger restaurants that hasn’t yet made it out here to the western states. These restaurants have always had a bit of a special meaning to my family. The original one was located in Normal, Illinois, which is where I was born, and it is an often told story within our family that my parents’ first date was at a Steak ‘n Shake. Since I’ve been old enough to remember, I’ve never actually lived in a town with a Steak ‘n Shake, so visits there are a kind of special treat when the opportunity arises. The menu is a pretty straightforward burgers and fries selection, but the food quality tends to be extremely high. The “steak” in the name of the restaurant refers to the generally high-grade of ground beef that they use to make their burgers and I do think that is reflected in how they taste. As the name suggests, they also offer a good selection of flavors of real ice cream milkshakes as well. I was a little disappointed when they had run out of the peppermint milkshakes that they were advertising on the placemats, but I was able to get a mint chocolate chip one that was a pretty darned good substitute. While the food was great, we were disappointed by the service. While the waitress was friendly enough, our orders were all exceptionally slow in coming. We were particularly surprised at how long it took for the shakes to arrive, with them coming after the food. My sister had a bit of a sore throat from a cold and had asked the waitress to expedite her shake, so she was more than a bit irritated when her shake not only took a while, but actually came about 5 minutes or so after the rest of our shakes were brought! My parents mentioned that, unfortunately, this slow service is a bit typical of the Clermont location. Day 2: First day at WDW! We headed over to Walt Disney World fairly early on the 2nd to check into Bay Lake Tower for the rest of our visit. 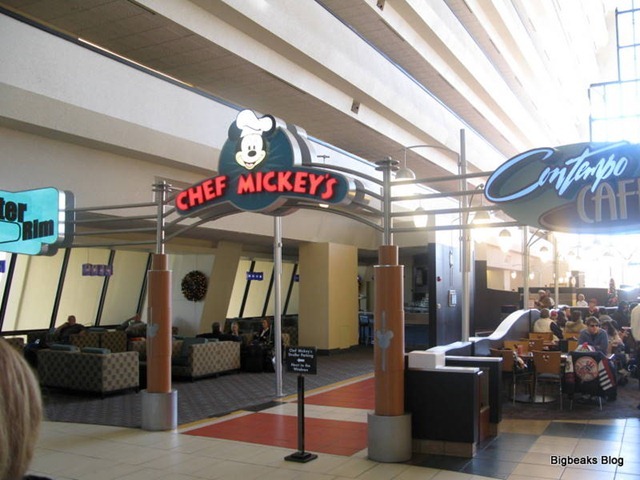 We have generally found that a character meal or some highly-themed restaurant usually is a great way for us to get into the right mood at the start of our visit, so I had made a reservation for noon at Chef Mickey’s in the Contemporary. When I made the reservation, I actually thought I was scheduling lunch. 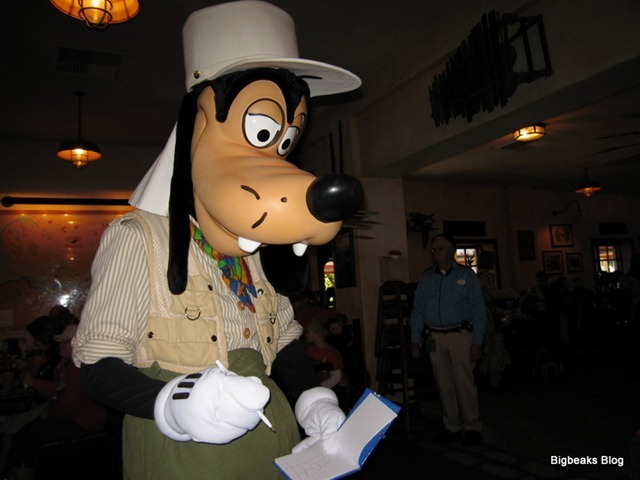 I later learned that Chef Mickey actually doesn’t serve lunch at all and that they simply were scheduling breakfast reservations up until 1pm that day. We typically like breakfast buffets anyway and have never been all that picky about what time we eat that kind of food. In fact, we probably have traditional breakfast food (such as pancakes or bacon & eggs) for dinner more often than we do in the morning. By the time we got to the hotel and finished getting checked in, it was still only a little before 11. I decided to try asking at the podium to see if they could seat us earlier than our reservation and learned that they actually weren’t that busy and could take us right away. This would work out well and let us get to the park a bit earlier. We were also hungry, so we didn’t really want to wait longer anyway. Before we were seated, we were all guided over to a photography station for a family photo. This has become a standard part of all the character meals at Disney World (and at Disneyland as well) now. The photo isn’t on their Photopass system, though. Instead, someone comes around to your table during your meal trying to sell you a package of printed photos for $30. One thing we found strange at Chef Mickey’s was that the photo was with a plywood cut-out of Mickey Mouse rather than with the costumed character. We didn’t purchase any of the photo packages on the trip, even though a couple of the photos were kind of cute. The price just seemed overly high for what you got, particularly since it didn’t include any digital copy of the photo. The last couple times we did character meals at Disneyland, I remember that the attendants made a point to specifically offer to also take pictures using our own cameras during these photo sessions. No such offer was made at any of the Disney World meals and I really didn’t get a vibe that such a request would be welcome. The meal at Chef Mickey’s was a pretty typical breakfast buffet with the usual selection of eggs, bacon, sausage, potatoes, pancakes, waffles, French toast, fruit, pastries, etc. The food was generally good, although nothing overly special. One odd thing we noticed at this meal as well as the other breakfasts we attended on this trip was that their bacon seemed to be oddly kind of lacking in flavor. I think my favorite item on this buffet was a potato dish that was mixed with cheese and bacon. The pancakes and French toast were prepared fresh at a grill station, which was nice. Unlike at Disneyland, the breakfast buffets in Florida usually don’t have omelet stations (I think the ones at the Grand Floridian and the Beach Club are the exceptions), so I’m typically not fond of the eggs available since most people seem to like them more runny than I do. The primary reason that we go to a restaurant like Chef Mickey’s is the character interaction and that was generally good. Over the course of the meal, we had visits from Mickey Mouse, Minnie Mouse, Donald Duck, Goofy, and Pluto. Besides that the restaurant was located in the resort where we were staying, the fact that it features the core group of Disney characters made it a very appealing first activity. The characters visits were spaced pretty reasonably and we overall had a really good time. We spent the rest of the afternoon and evening at Epcot. For dinner, we decided to eat at Liberty Inn, the counter service location located in the American Adventure building in World Showcase. It is mostly a burger and fries type fast food restaurant, although we were pleased to find that they did have a couple of slightly more upscale offerings including a roast beef & cheddar sandwich and a barbecue pork sandwich. In fact, I ended up having the roast beef and my wife had the pork. The food was generally good, something that isn’t always true at Disney’s counter service restaurants. My only real complaint was that the service was very slow, particularly if you had any kind of special order. The roast beef and cheddar sandwich normally featured a couple toppings that I don’t generally like, so I asked for it plain. That wasn’t a problem, but it ended up taking them 10 minutes or so to get it ready. They held our entire order until that was ready and we had to stand at the counter waiting for it while other customers maneuvered around us to pick up their own orders. I definitely would have preferred for them to at least give us the rest of the order right away (particularly our son’s), even if they didn’t have the staff available to bring the special order out to us. We also weren’t warned that the special order would take so long. I might have opted with something that didn’t need customization, if I had known about that. On Sunday, we had plans to meet up with some friends who live in the Orlando area and spend the day at Disney’s Hollywood Studios. Having stayed out late the night before, we ended up sleeping in a bit and arriving at the park right around noon. Our friends were already having lunch at ABC Commissary, a large counter-service fast food restaurant themed to Disney’s TV network. The main decor of the restaurant primarily features posters from current ABC series and video monitors showing promos and behind-the-scenes clips. Even though Disney’s burgers generally don’t tend to be very good, we all ended up deciding that cheeseburgers sounded the best to us of the restaurant’s menu choices. To my surprise, the burger was actually pretty decent. It wasn’t nearly as dry and overcooked as I’ve generally found Disney’s burgers to be in the past, even at that same restaurant. I don’t know if they have improved the quality or if we just were there on a good day, but it wasn’t a bad lunch at all. For dinner, we had reservations at Sci-Fi Dine-In. This table-service restaurant is themed like an old drive-in movie theater. 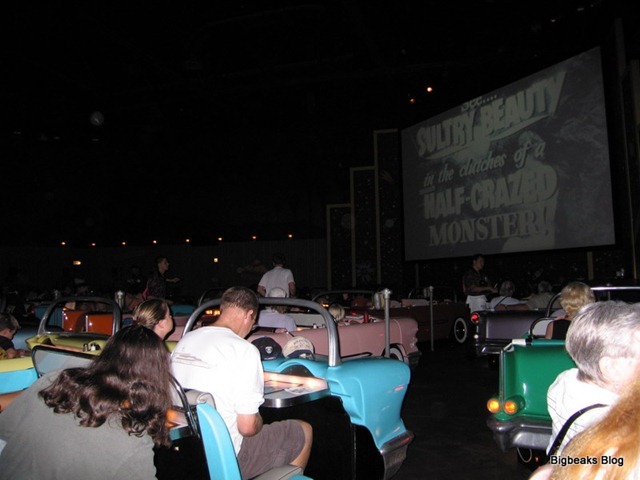 The tables are shaped like cars and a large screen in the front of restaurant shows clips of cheesy old science fiction and monster movies, interspersed with the occasional theater refreshment stand promos. 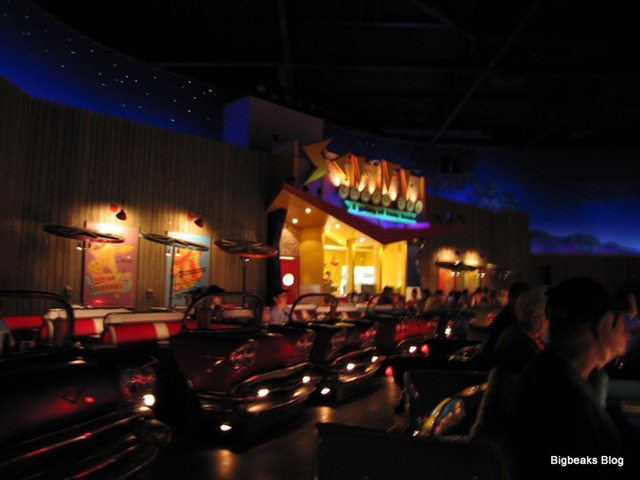 This is probably the best themed restaurant at Disney World and we re-visit it pretty often for that reason, but my experience has always been that the food is kind of mediocre, unfortunately. On this visit, I ordered the St. Louis-style BBQ ribs. They were generally pretty tasty and the sauce was pretty good, but I found them to be much more fatty than I would have liked. My wife had the ribs as well and also noted the same thing. A couple other members of our party had the Reuben sandwich (something I don’t really like) and seemed happier with the quality. The hot fudge sundae that I had for dessert was large and really good. Day 4: Steak, cheese soup, and cake! 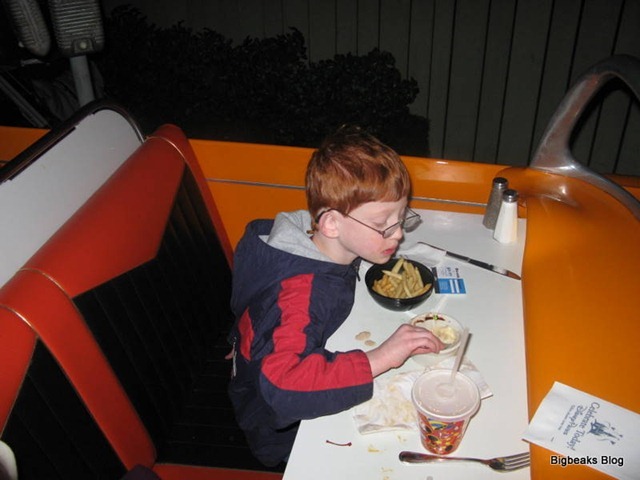 A few years ago, during our first visit to Walt Disney World with our son, we scheduled a date night where we left him with my parents while we went out to a nice dinner. Having heard very good things about it, the restaurant we chose for that dinner was Le Cellier, the steakhouse located in the Canada pavilion at Epcot. We enjoyed the restaurant so much that it has now become a tradition to plan a meal there during every visit. For this trip, we decided to get a lunch reservation for early Monday afternoon. In recent years, Le Cellier has become one of the most difficult reservations to get at Walt Disney World, particularly since it is among the highest-end restaurants that still only requires a single table-service credit on the dining plan. We thought it would be a bit easier to get our choice of day and time if we went with lunch and I did, in fact, have no problem with it, although I did call the reservation line soon after it opened on the first day we could make reservations. My wife and I definitely tend to be fairly traditional meat & potatoes fans and we both really enjoy a good steak. The steaks at Le Cellier have been very good and they do offer a pretty decent selection of cuts. There are plenty of other good places to get steak at Disney World, though, and we generally do end up having it at least a couple times during our visits. Our experience with the steaks has actually been a little bit hit and miss, in fact. I recall one previous visit where I had to send it back because it wasn’t cooked right and on this visit I found that the meat was a bit cold, although it wasn’t so much so that I felt the need to get it corrected. The bigger appeal at Le Cellier that keeps us coming back really are a few of the non-entree selections. In particular, I am a huge fan of their Canadian Cheddar Cheese Soup while my wife absolutely adores the Chocolate on Chocolate Whiskey Cake that they offer for dessert. These actually are individual preferences on our part, though, as my wife doesn’t really like the soup at all while I find the chocolate cake to be a bit too rich after such a big meal. Another major favorite of ours is the bread. At the start of the meal, they bring out a basket with several varieties of warm, soft breadsticks including sourdough, multi-grain, and pretzel bread. The server recommends sampling all three and offers to bring out more of any type. We now know that the pretzel bread is our absolute favorite and always immediately ask the server to bring us more of it. I find the decor at Le Cellier to be generally appealing as well. The layout is organized into sections themed to the Canadian provinces. Right after you are seated at your table, the greeter gives a short overview of the province for that section. The overall look has a generally casual elegance to it that I find to be very pleasant. The only slight negative is that the tables are pretty tightly packed into the restaurant, so it can feel a bit cramped and can occasionally be a bit noisy. For the most part, this has never been a big problem for us, though. Our experiences at the restaurant have also always been enhanced by consistently very good and friendly service. The meal at Le Cellier tends to be quite filling, so we weren’t really hungry again until later than usual. After lunch, we went over to the Magic Kingdom for the afternoon and stayed for the 8pm fireworks show. After the fireworks, we walked back over to the Contemporary and had dinner at Contempo Cafe, the hotel’s quick service location. We had done the same on our previous trip and had found that it worked really well. Since we were actually staying at the Contemporary Resort this time, it worked even better for us. It was only about 25 minutes from the time that the fireworks ended until we were seated at the restaurant. The Contempo Cafe is one of a few newer quick service locations at Disney World that has gone to a touch-screen ordering system. When you arrive at the restaurant, you go to one of the kiosks to order any entrees/meals. It then prints out a receipt that you take to a cashier along with any grab-and-go items that you are adding to the order. The system works okay, although it does feel a bit impersonal and I couldn’t help but wonder if it really saves all that much time and labor cost over simply having the cashier take your order, particularly since they still need to keep an employee near the kiosks to answer any questions or help out customers who aren’t really comfortable with that kind of system. For dinner, my wife and I both ordered the pepperoni flatbread. We got a kick out of the fact that the receipt actually said “pepperoni pizza” instead, since that is obviously what it really was. We were happy that the pizza had a really thin crust, since that is the way we both tend to like it best. As was typical of Disney’s pizza (and theme park pizza in general), the crust and sauce was pretty bland, but it overall wasn’t too bad a meal. The portion sizes were generous and made for a pretty filling dinner. We ventured away from Disney property on Tuesday for a visit to Universal Studios Orlando. Thanks to a relative that works there, we had complimentary tickets that allowed us to visit both theme parks on that same day. We also had purchased tickets to see the Blue Man Group show at Universal Citywalk that evening. During our entire visit to Florida, they were having an unusually extreme cold spell, with temperatures frequently in the 30s or 40s. The day we were at Universal was especially cold, with a very frigid wind blowing. Because of this, we decided that a fairly leisurely, table-service lunch at an indoor restaurant sounded good. We opted to eat at Mythos in Islands of Adventure, which has pretty often been rated towards the top of the quality ratings for theme park restaurants. While I’m sure that a lot of people were looking for indoor dining choices that day, Universal has a lot of options and the parks were not overly crowded. Probably because of that, we only had to wait about 15 minutes or so for a table. Our table was fairly far inside the restaurant, fairly close to large windows that provided a pretty nice view across the park’s central waterway over towards the Super Hero Island section. The overall decor of the restaurant is bright and cheerful. There are fountains providing a pretty continuous sound of running water, so it is probably a good thing there are restrooms inside. After several hours out in the cold, soup sounded particularly good. I tend to really like tomato soup and saw that was listed on the menu. When I ordered it, the waiter warned that it contained Italian sausage, which prompted my reply of “good!” It is definitely wise that they warn about that, though, as people might expect that to be a vegetarian option. The soup was very good, with a flavor that kind of resembled a rich spaghetti sauce. A couple thick, oversized croutons were included to help add a little additional bulk to it. The hot soup was a big help in getting warmed up and one of the highlights of the meal. While the menu included several entrees that sounded pretty good, I really didn’t have too much trouble choosing once I saw that one of the choices was Blueberry and Pistachio Crusted Pork served in port wine sauce. Grilled pork is something I particularly like, but don’t get very often and I also really love port wine sauce. The sauce also had crumbled blue cheese, which is another favorite of mine and a flavor that I think goes especially well with the port wine sauce. The pork was as good as it sounded. The blueberry and pistachio crust provided a particularly good mixture of slightly tangy sweet and nutty flavor that really complimented the sharper flavor of the port wine sauce. Instead of serving the pork with something fairly traditional like mashed potatoes, the included side dish was macaroni and cheese. The cheese sauce was made with smoky cheddar, a type that I particularly like and which provided quite a bit more flavor than a more typical macaroni and cheese. While this was a somewhat unusual side dish, I thought it was really good and this was a fairly rare case where I completed finished the side dish with an entree. While Mythos is a high-end, fairly expensive restaurant, their menu isn’t overly exotic and worked well even for the fairly picky eaters in our group. My wife had a bacon cheeseburger, which she said was very good and was clearly made with very high quality ingredients. Several other members of our party had the grilled chicken club sandwich, which they were very happy with as well. 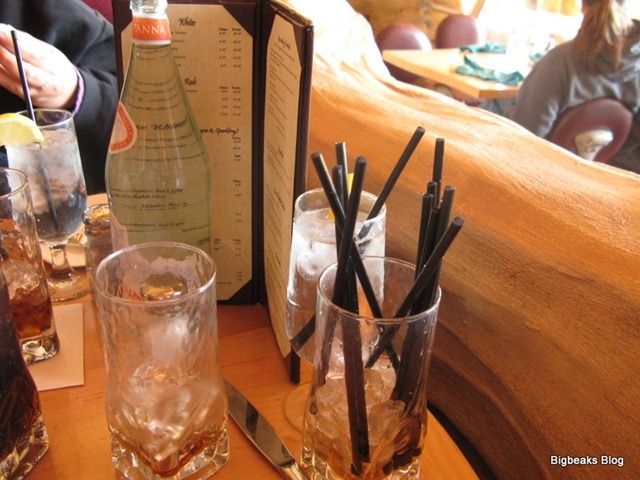 One strange part of the meal was that we ended up with an unusually large accumulation of drinking straws. I had ordered Mr. Pibb to drink and a couple other people in our party ordered Diet Coke. I guess in order to help the servers identify the drinks, they put 3 straws in the Mr. Pibb and 2 in the Diet Coke. This was not only the case with the first ones, but with each subsequent refill. The refills were always brought in new glasses and they didn’t very frequently take away the old one. Over time, we ended up with a huge quantity of straws and generally amused ourselves by putting them all into one glass. While it was pretty funny, it also strikes me as being rather wasteful and I think the restaurant really needs to come up with a better system for keeping track of the drink types. Our only real complaint about Mythos was that the service was a bit slow. The waiter was certainly friendly enough and they were pretty good about keeping up with drink refills, but it took quite a while before he took our orders and then the time between courses and the time to get the check delivered and processed all seemed longer than they should have been. While we weren’t in an extremely big hurry, it definitely did seem like the pace should have been faster, particularly in a theme park setting. After having had a pretty large and elegant lunch, we went to kind of the opposite extreme and just got fast food from the food court at CityWalk. The food court area is pretty small, with only four restaurants and fairly limited indoor seating. With a little persistence, we were able to eventually grab a table, so we did at least avoid having to eat outdoors in the cold. My wife, son, and I all got food from the Burger King “Whopper Bar” while my parents and sister split a large order of nachos from Moe’s Southwest Grill. The “Whopper Bar” concept emphasized the choices of toppings on the burgers, but really seemed more like an excuse for a Burger King with a drastically reduced menu. While the name kind of seems to suggest a do-it-yourself topping bar, it really is just a stand where a large menu board lists the choices of toppings and you specify what you want when ordering. The only available entrees choices were the Whoppers or chicken strips, with none of the other Burger King entrees available. They didn’t even have kids’ meals available, so our the only burger available for our son was a Whopper, which is a bit big for him. My wife and I both got chicken strips, since she had a cheeseburger for lunch and I don’t really like Burger King’s burgers very much. The food was typical Burger King food, although more expensive than usual. Wednesday was another fairly late start day after the very full day at Universal. We had made plans to meet up with some friends at the Magic Kingdom shortly after noon and arrived there pretty much exactly the scheduled time. For lunch, we all decided to go to Columbia Harbour House, a seafood fast-food location in the Liberty Square section of the park. This is often one of the busiest locations in the park, but it wasn’t an especially busy day which means there were very short lines at the cash registers and we didn’t have any major difficulty finding a table. I had the fried shrimp for lunch, which was fine for basically fast food shrimp, but nothing to get too excited about. My wife doesn’t like seafood at all, so she had chicken nuggets. For dinner that evening, we had reservations at another of our favorite Disney World restaurants, Whispering Canyon at the Wilderness Lodge. This was a restaurant that I first discovered during a one night stay at the hotel, just a year or so after it had first opened. At the time, the restaurant was fairly unknown and we got lunch there without any real idea what to expect. It now one of the best known restaurants at Disney World, but it still remains one of our favorites. Even the time while waiting for a table at this restaurant is more kid friendly than most. 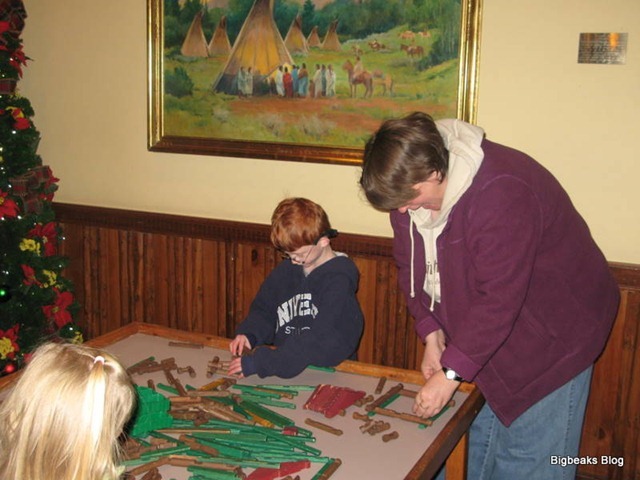 In the lobby area, they have a big table with a large collection of Lincoln Logs for kids (and grown-up kids) to play with while waiting. 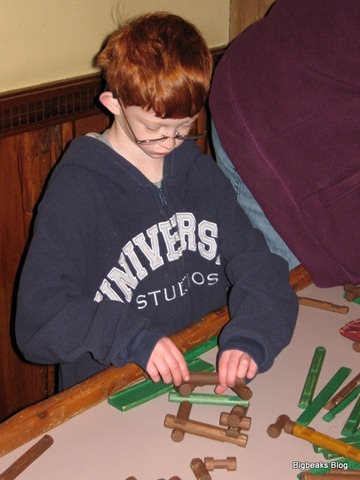 This is something our son finds particularly fun, since he has lots of Lincoln Logs at home as well and plays with them pretty regularly. He especially enjoyed getting some help from his Aunt, who seemed to have fun playing with them too. Whispering Canyon is essentially an old western show at a restaurant. The servers and other staff all stay in western character and maintain a very fun, extremely rowdy (and sometimes rather loud) atmosphere. The menu is mainly barbecue with the featured meal the all-you-can-eat Canyon Skillet, which includes BBQ ribs, pulled pork, beef brisket, BBQ chicken, and traditional side dishes including mashed potatoes, corn on the cob, beans, corn bread, and salad. This is all served family style and you can request more of anything. While they do have various ala-carte selections on the menu as well, we all ordered the skillet as we usually do. While there are a couple items included that I’m not entirely crazy about, there is so much food offered that it doesn’t matter much. In particular, I don’t really like the way they spice the chicken very much and I’m also not that fond of the apple vinaigrette dressing used on the salad (I generally don’t like sweet dressings), but there are other items that provide more than enough to fill me up. I especially really like the pulled pork and the beef brisket. Another favorite feature at Whispering Canyon is that it is, I think, the only restaurant that I have ever been to that offers free refills on milkshakes. They use fairly small glasses for them, so the refills are needed, but it is nice being able to basically pick how much you want. They also have a pretty good selection of flavors and you can switch to different ones on the refills, if you wish. I particularly like the orange shakes, which I find especially refreshing and go rather well with the barbecue. 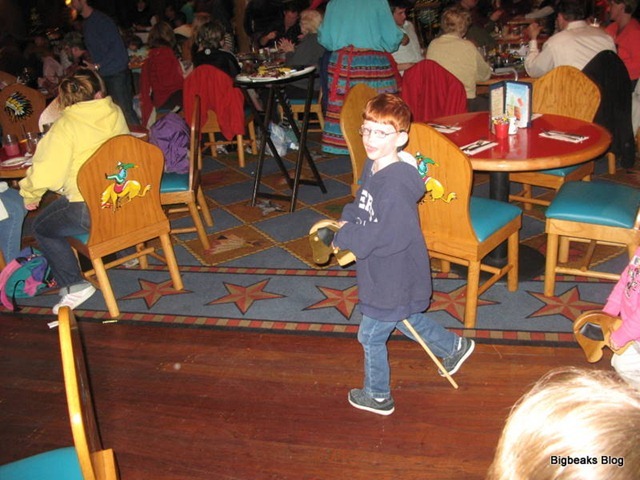 One of the regular activities at the restaurant is broomstick horse races around the restaurant for the kids. This year was the first time our son was really into it, although last year he did kind of half-heartedly participate. This year, he was pretty much looking forward to it the whole time and took part with a huge amount of enthusiasm. Of course, one of the funnier parts of the whole thing is all the parents (or grandparents) chasing the kids around the restaurant with cameras. Our second character meal of the trip was on Thursday morning at Tusker House in Disney’s Animal Kingdom. This restaurant was converted from a counter service location to a buffet a couple years ago. We had the lunch buffet (which isn’t a character meal) last year, but this was our first time there for breakfast. We had also done the previous incarnation of the character meal when it used to be held in the Dinoland USA section of the park in previous years. This breakfast actually turned out being the one mistake we had made in scheduling out our dining reservations. Planning an all-you-can-eat breakfast buffet the morning after a heavy all-you-can-eat barbecue dinner simply wasn’t a very good idea. I ended up not eating all that much at this meal and overall can only give a very limited perspective on the food. Our reservation was right at park opening, which meant that we were actually allowed into the park a bit early. One of the entry turnstiles was labeled with a sign inviting those with Tusker House reservations and they had a castmember there to check names off the reservation list before letting guests into the park. More castmembers were stationed along the path to the restaurant to help guide guests to the restaurant. It was really kind of cool walking through the nearly empty park before it opened. As with our breakfast at Chef Mickey, they guided us over to do a family photo before taking us to our table. 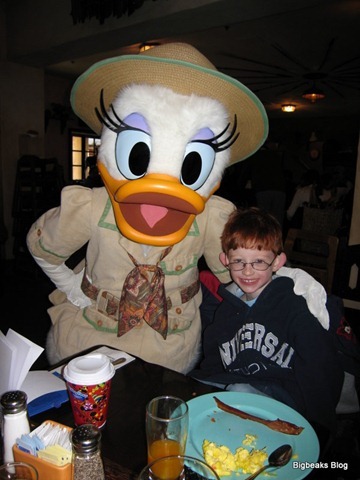 The featured character at the Tusker House breakfast is Donald Duck and this time the photo was actually with the costumed character instead of with a plywood cutout like it was at the other restaurant. As before, I didn’t really feel all that comfortable with asking them to take a photo with my own camera as well, but I really wish I had in retrospect. 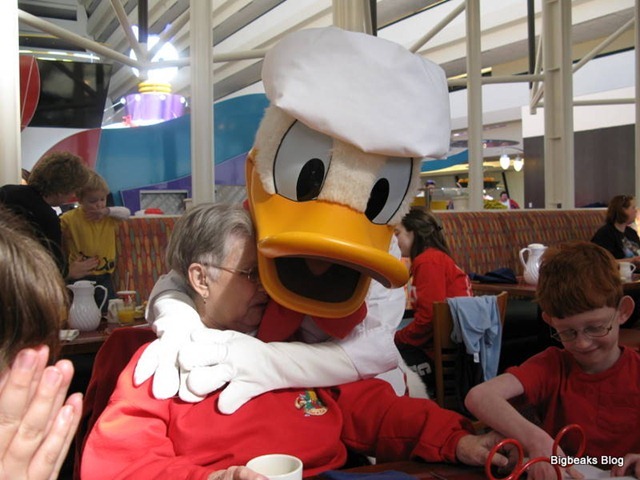 I didn’t realize that this pre-meal photo was the only opportunity to visit with Donald at the breakfast named for him. 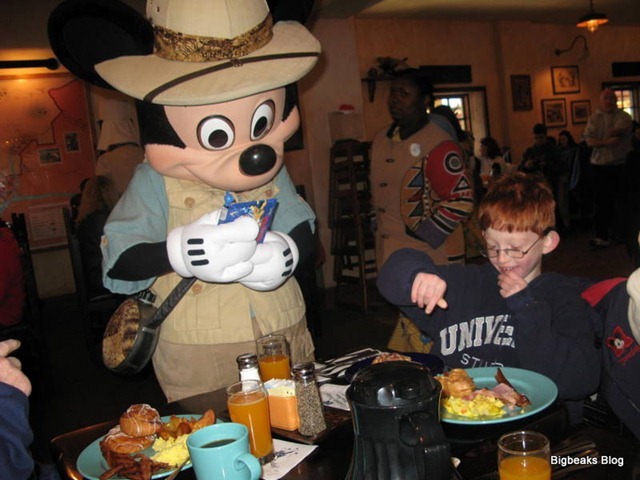 During the meal, we had visits from Mickey Mouse, Daisy Duck, and Goofy (all dressed in safari outfits), but Donald did not circulate through the restaurant. The character interaction was generally fine, but nothing particularly memorable. I did kind of wish that I had given a bit more thought to which characters appeared at which character meals as the ones we ended up scheduling generally featured the same ones. As I mentioned, I didn’t eat very much at this meal, but the choices seemed to be pretty standard breakfast buffet options, very similar to what was offered at Chef Mickey. One highlight of the meal was the “jungle juice” that is served with the meal. This is a mixture of lemonade and orange, pineapple, and mango juice and was extremely tasty. I had several glasses of it and my son absolutely loved it as well. I did have one big complaint about the food. One egg dish that they offered was labeled simply as a “ham & cheese scramble” and definitely looked like something to my taste. I took a good sized helping and didn’t discover that it also contained onions until after I had taken a big bite of it. I have a pretty high sensitivity to onions where even a fairly small quantity can give me some pretty severe indigestion. I realize that this probably isn’t an extremely common food allergy/sensitivity, but I also don’t see why it would hurt for them to add the words “with onions” to the sign that they had in front of the dish. For lunch, we wanted something very light, particularly since we had a pretty big dinner planned for that evening. We ended up going to Pizzafari, where we realized that we could get away with using our dining credits to get enough food for all of us to share, including my parents and sister who weren’t on the plan. We ordered two pepperoni pizza meals, which was enough for each of us to have 1-2 slices. The meals also came with a couple salads and desserts, giving us a bit more food. We did still get a full child’s meal for my son. This proved to be plenty of food for all of us. The pizza was typically bland Disney theme park pizza, but edible. Ever since we started doing trips with our son, my wife and I have always tried to schedule one date night dinner together while my parents babysit. With Animal Kingdom typically closing fairly early (5pm in the off season), I realized that night would be a good time to schedule this. With the trip taking place just a week after Christmas, I clandestinely made the babysitting arrangements with my parents (their response when I asked was “We thought you’d never ask!”) and the dining reservation. I printed out a copy of reservation confirmation, put it in a box, and then wrapped it and placed it under the tree for her to open on Christmas morning. After doing some research and exploring a number of options, I ended up making a reservation at Fulton’s Crab House in Downtown Disney. At first, it might seem like a bit of an odd choice since my wife won’t eat any kind of seafood, but she actually has something of a fondness for seafood restaurants as they pretty much always offer really good steaks, which she absolutely loves. The restaurant had the added advantages that it was somewhere we hadn’t been before and it is also one of the few Disney World restaurants left that do not take the dining plan making it a fairly easy reservation to get. I already knew we weren’t going to use a dining credit for this meal, as this gave us one more table service reservation than we had credits. One challenge to this choice of restaurant was the fact that Animal Kingdom and Downtown Disney are at opposite ends of the Walt Disney World property, meaning that it can take a while to get from one to the other. This is compounded by the fact that Disney does not run any direct buses between the theme parks and Downtown Disney (probably to discourage people from abusing the free parking at Downtown), meaning that you have to first take a bus to one of the resort hotels and then transfer. We underestimated the time a bit and ended up about 20 minutes late for our reservation. Fortunately, I suspect they were pretty used to that, as they didn’t indicate it was a problem at all and we were still seated immediately. Part of our mistake was choosing Saratoga Springs as the transfer resort. We picked it because there was a bus already loading when we walked up to the bus stop and because it seemed to make sense, knowing it was the closest resort to Downtown Disney. What we hadn’t thought about (but should have since we stayed there last time), was that there are quite a few bus stops within Saratoga Springs, which adds a fair amount to the travel time. It also didn’t help that we needed a restroom stop when we got to Saratoga Springs and it took a little longer to find one than we had expected. In retrospect, we definitely should have transferred at one of the single bus stop resorts instead. Fulton’s is located in the riverboat-shaped building in Downtown Disney. This was originally known as The Empress Lilly (names for Walt Disney’s wife) and contained a couple restaurants operated by Disney until the mid-90s. The building was then leased to another restaurant company (Levy Restaurants) that refurbished the structure and re-opened it as Fulton’s. It definitely makes for one of the most appealingly unusual decors at Downtown Disney. Our table was on the second level and had a great view across the lake. As I mentioned, my wife doesn’t like seafood at all and, thus, was very happy to order the New York Steak. She was very happy with that selection, saying it was one of the best steaks she’d had in a while. She gave me a little taste of it and it definitely was very good and tender with lots of flavor. While I don’t like most kinds of regular fish, I really like shellfish a lot. At a restaurant that had the words “Crab House” in its name, it wasn’t hard at all to decide to order the Alaska King Crab Legs for dinner. The crab legs were absolutely terrific, with a good flavor that wasn’t too strong. Other than one time several years ago at a high-end wharf-side restaurant in Seattle, the crab legs that I had at Fulton’s were the best I remember having. The only minor complaint that I had was that the melted butter came in a container so shallow that it had all spilled by the time the plate was served to me. The server was quick to replace it while indicating that this happened pretty often. It wasn’t a big deal to me since I like to use butter with crab legs, but I know some people who don’t and probably wouldn’t have been happy to have it spilled all over the plate. They should replace the containers with ones that don’t spill as easily. At the beginning of the meal, they bring out a plate of crackers with a crab and creamed cheese based spread. This spread was absolutely wonderful. When they brought it out, they also gave us a card with the recipe on it, so I would imagine that they had received lots and lots of requests for that in the past. Since it contained crab, my wife wasn’t interested in it at all, but I had no problem finishing it all myself. They also brought out some fresh bread with butter, so my wife was very happy with that. While Fulton’s did offer a few desserts that sounded pretty good, we decided to instead go across the way to the Ghirardelli Soda Fountain to get ice cream sundaes. This turned out to be a great choice. We were both able to get really good (and fairly large) sundaes customized to our taste and the price was actually a bit less than we probably would have paid to split a dessert at Fulton’s. The only small down side was that we were only able to find a table outdoors, but fortunately this was the one day of our trip where the weather had warmed up a little bit, making that tolerable. For our last full day at Walt Disney World, our main plans were to generally take it easy, but try and catch up with a few attractions that we hadn’t managed to see previously. We were up and ready to go by mid-morning, so we decided to go over to the Contempo Cafe to get breakfast before heading out to the parks. Just like at dinner time, the order for the main entree was placed using the touch-screen kiosks and then drinks or other items are gathered and taken to the cash register to pay. My wife and I both ordered the French Toast while our son got the kid’s meal with Mickey Mouse shaped waffles. The food was ready pretty quickly and tasted fine, although we found that the bacon was relatively flavor-less, just like at the previous breakfasts we had attended. One kind of strange thing with breakfast purchased using dining plan counter service credits is that it comes with two drinks instead of a drink and dessert like you get at other meals. I guess that does make sense for some, since many people might want both juice and coffee with breakfast. Since none of us are coffee drinkers, though, it would have been much nicer if there had been an option of getting a pastry or something like that instead of the second drink. What we ended up doing was each getting a bottle of water as our extra drink and then saving them for use later. Since we had a somewhat late and larger than usual breakfast and had reasonably early (6pm) dinner reservations, we decided to use up some of our snack credits for a very light lunch. After a short visit to Disney Hollywood Studios to see the “Lights, Motors, Action!” stunt show, we had arrived at Epcot around 2pm. We then headed over to The Land pavilion, since we knew the Sunshine Seasons food court there had a pretty broad selection and we could likely come up with good choices for snacks. My wife and I both ended up getting pastries from the bakery while our son had a pre-packaged fruit plate. My wife and I also got soft drinks while our son had a bottled Poweraid. We were able to get all of these items using snack credits and it worked out to a pretty reasonable light meal. It was probably the best single use of snack credits that we had on the trip. Dinner on Friday was at Coral Reef, the restaurant adjacent to the Living Seas pavilion at Epcot. This was one of our son’s two special requests for restaurants and, unfortunately, the only one we were actually able to do since Crystal Palace (his other choice) was closed for refurbishment. He had especially enjoyed watching the fish and other sea creatures at Coral Reef during a previous visit there, so he was excited to go again. Of all the dinners that we had with the entire family on this trip, I think this was the best overall experience. The atmosphere was as much fun as we remembered and the food and service were both excellent. While we had enjoyed our previous visit, this one really made a pretty strong impression and I suspect this will move much higher on our list for repeat visits. While still nominally a seafood restaurant, Coral Reef has shifted its menu in recent years to have a little more broad variety. I’d guess that only about half the entrees are now seafood and I seem to recall that those were all items like tuna or salmon, without any shellfish options. All of the adults in our party ended up opting for the New York Strip Steak. Even my wife, who had ordered steak at Fulton’s the night before, decided that she didn’t want to watch everyone else eating steak without having one herself. She decided it was hardly a hardship to have steak two nights in a row. The steak was very tender and flavorful and was cooked exactly to my liking. The side dishes with the steak were roasted potatoes and a watercress salad, both of which I found very enjoyable and actually finished completely. The salad was served with a light vinaigrette dressing that gave it some extra flavor without overwhelming it. Since it is no longer included with the dining plan, I decided to skip an appetizer at this meal, both to save some room for dessert at well as to save the extra cost. During my previous visit, I had the lobster bisque, which I enjoyed and a couple members of our party ordered it this time as well. One of those that ordered it was our 6-year-old (appetizer was included on the kid’s menu), who I don’t think has ever found a soup that he doesn’t like. While lobster bisque is not an item that most would think of as kid-friendly, he pretty much gobbled it right down and seemed to enjoy it immensely. 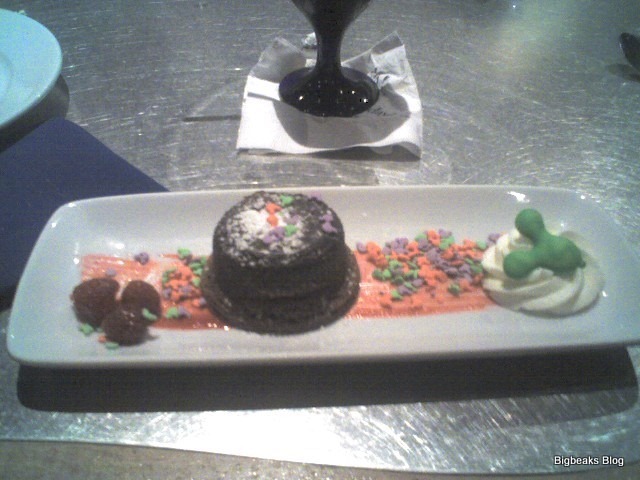 For dessert, I opted for The Chocolate Wave, which is one of the restaurant’s signature desserts. It is a dark chocolate cake served warm with a Grand Marnier based filling. It was absolutely wonderful and a great ending to an excellent meal. Others in our party had ice cream sundaes or the Cremé Brulée and everyone seemed quite happy with their selection. Of course, the setting is one of the big attractions of this restaurant and we were fortunate to be seated at a table on the first level of the restaurant, fairly close to the aquarium glass. We were in the second row of tables rather than directly up against the glass, but still had an excellent view of the marine life. Our only minor complaint was that the large curved booth was a bit cramped for our party of six, but it was definitely tolerable. The service was very good, with a server that was both attentive and courteous. We did have a minor issue where the soft drinks didn’t taste right when they first came out. It tasted like the carbonation had run out or the mixture was off. The server told us that she would get us replacements from “upstairs” and those were fine. There was one other occasion where she indicated that something else needed to be retrieved from “upstairs” and it became a bit of a running joke in our meal. I don’t think we ever did figure out exactly what “upstairs” meant in this context. On our trips, it has become a tradition to schedule one last table-service or buffet breakfast for the morning of the day that we travel home. We have always scheduled flights for late in the day (departing in the 5-7pm range), which has made this possible. Since we stayed at the Contemporary this time, we decided to go to the character breakfast at ‘Ohana, a short monorail ride over at the Polynesian Resort. This is an all-you-can-eat breakfast, where the food is served family-style. The meal includes standard breakfast items like scrambled eggs, sausage, bacon, fried potatoes, waffles, and various fruits and breads. During the meal, you can ask for more of any items as needed. They also served what they called “aloha juice”, which I think was pretty much the same thing as the “jungle juice” that had been served at Tusker House. One advantage of this type of meal over a typical buffet is that there is a little more room for special requests. Specifically, I and a couple other members of our party prefer eggs to be cooked very well done (not runny at all). They were very willing to accommodate that request and actually brought out some that were less well-done as well, for the one member of our party that preferred them that way. 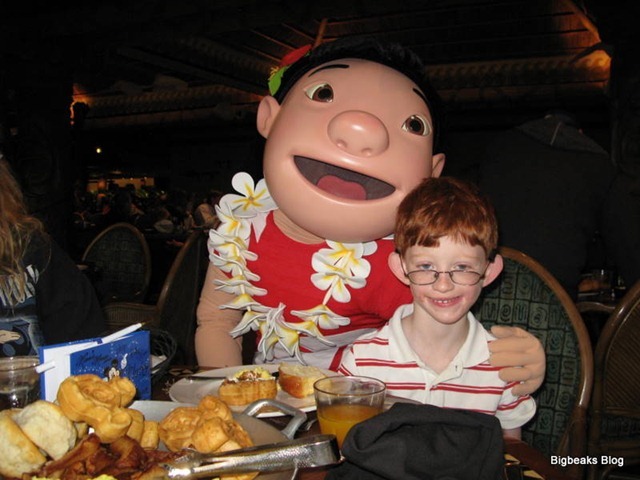 Fitting with the Hawaiian theme of the hotel and restaurant, the featured characters at the meal were Lilo and Stitch. Both visited our table, as did Mickey Mouse and Pluto. 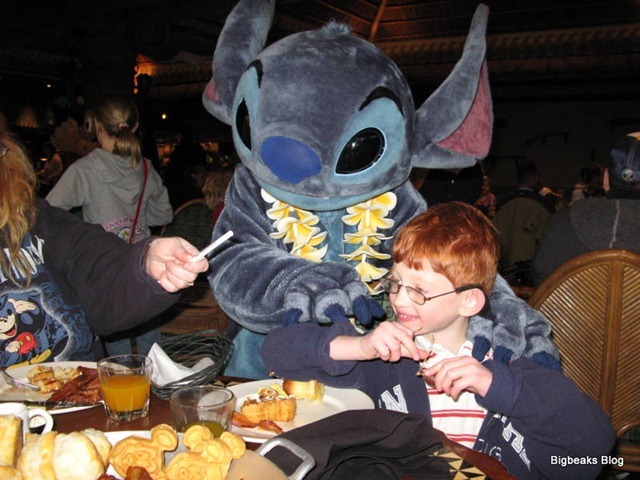 Once during the meal, the characters invited the kids to join in a conga line while “Hawaiian Roller Coaster Ride” (from the movie Lilo and Stitch) played on the sound system. I think our son was pretty worn out by this point in the trip, though, and he declined to take part in that. As with the other character meals, they did have us take a family photo before we were shown to our table. Strangely, the photo at this restaurant was taken against a fairly generic tropical backdrop and did not involve any characters at all, either costumed or a cut-out. Because of the generic nature of the pictures, the package was even less tempting than at the other locations. Usually we make one last visit to a theme park (typically The Magic Kingdom) after our breakfast on the last day of the trip. We had originally planned to do that on this trip as well, but I think we had simply had enough of the cold weather. The temperature had taken another nosedive on that last day and there had even been some hail and sleet in the early morning. We finally decided to just stay indoors wandering around the monorail resorts until time to leave for the airport. We didn’t need to catch the bus to the airport until around 4pm and we still had one counter service credit each left to use for our lunch. 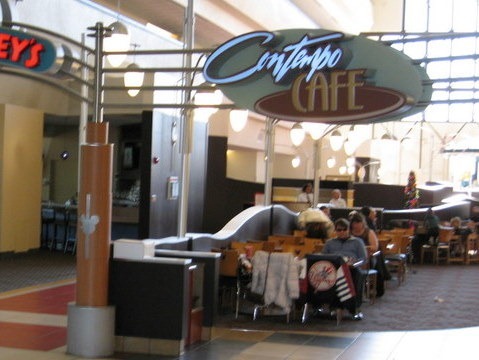 Our first thought was to have one more meal at the Contempo Cafe, but we decided against that due to the temperature. The 4th floor of the Contemporary (where the restaurant is located) is pretty much open to the elements due to the monorail track and it was rather cold there. We finally decided to take the monorail back over to the Polynesian and have lunch at Captain Cook’s Snack Company, the quick service restaurant there. We picked The Polynesian mainly because we knew you had to go outside to get from the monorail station to the quick service restaurant at the Grand Floridian. Captain Cook’s has a similar set up to the Contempo Cafe, including the use of the touch screen ordering system. The restaurant is a lot smaller and more cramped, though, and finding a table was a bit of a challenge. The menu included burgers and pizzas (again referred to as flatbread) as well as some stir-fry choices. My wife and I both ended up going with the pizzas again and they were basically identical to what we had at the Contempo Cafe earlier in the week. The restaurant has a bakery case as well and we both had cupcakes for dessert, which were pretty good. The meal at Captain Cook’s was adequate for our purposes, even if it wasn’t the most exciting final meal for our visit to Disney World. I did get a sense that this was a restaurant in need of some remodeling, as it definitely seemed pretty outdated and cramped compared to Contempo Cafe or even Roaring Fork, the quick service restaurant at the Wilderness Lodge, where we have eaten a number of times on previous trips. When reviewing the dining plan status printed on our lunch receipt, I found that we still had six snack credits remaining. During the last hour before our bus to the airport arrived, I went back up to the Contempo Cafe and used those snack credits to buy three brownies and three Mickey Mouse shaped Rice Crispy Treats. Actually, the latter were labeled as “crisped rice treats”, so I suppose Disney hadn’t licensed the Kellogg’s trademark. The brownies ended up working as a snack during the flight home and we ended up eating the Rice Crispy Treats a couple days later. For the last few years we have flown Delta Airlines to and from Florida, mainly because they have a pretty convenient schedule for direct flights. Like all the airlines, they have cut way back on the complimentary food services on most of their flights. On at least one previous trip, this had been pretty rough as we had really not had anything more than small bags of peanuts or pretzels during our flights and we had been really starving once we arrived. Fortunately, they now offer pretty decent $5 snack boxes that include some cheese, crackers, salami, and cookies. These aren’t anything too fancy, but they at least helped to make it through the flight. I suppose our last meal of the vacation was a fairly late night dinner purchased at a Wendy’s drive-thru on the way home from the airport. Overall, I think we ate really well on this vacation and enjoyed a good mix of re-visits to old favorites as well as a couple new choices. The dining plan continued to work for us, once again helping to facilitate a trip full of nice meals. 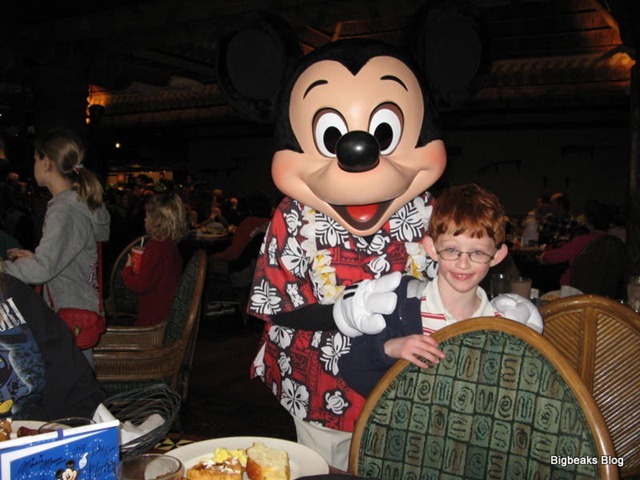 As our son gets older and starts enjoying a broader range of attractions, I suppose that dining could become less of a focal point of our vacation. For now, this kind of trip report seems to provide the best way to provide a good overview of our trip.